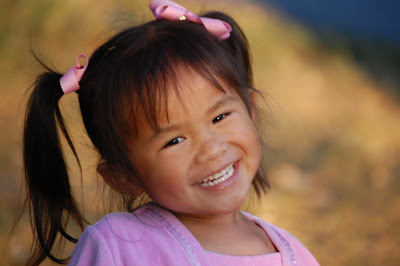 We brought our daughter home from China in Dec. 2006, she was a special needs baby with a diagnosis of cavernous hemangioma and concave chest. The hemangioma was bad but treatable. Shortly after coming home we found out her true diagnosis – NF1 (neurofibromatosis) It’s a genetic disorder, actually the most common type occurring in 1 out of every 3000. Symptoms can vary from nearly none to multiple. Sydney unfortunately has a very large tumor, it is wrapped around her left lung, her aorta, trachea, and her spinal cord. It also protrudes from her back. You would NEVER know she has anything wrong with her. There is no cure and the only treatment option is surgery. Sydney is NOT a candidate for surgery- there is just TOO much involvement. The ortho Dr. was hoping to have her chest repaired to help alleviate pressure on her spine as she has developed scoliosis (although I can’t tell) but this too is out of the question, it would just be too risky. There are a few clinical trials coming up that may offer a glimmer of hope. I would so appreciate a prayer request on your blog – we need all the prayers we can get! Please pray for Syndey and pray BIG! God knows what she needs. THANK YOU SO MUCH! I am just speechless…We SO appreciate each and every prayer on Sydney’s behalf. Oh Stef. My heart just breaks! Look at that beautiful face!! I prayed for her today and I will continue to pray. Lord Jesus, please wrap your arms around this precious family… lay your healing hands on little Sydney and give the doctors wisdom that can only come from THE GREAT PHYSICIAN. You can count on me to lift this sweet girl up in prayer. We serve a God who heals and restores. Please keep us posted with updates. I will CERTAINLY lift this beautiful girl & her family up in prayer!! I will definitely keep that sweet little girl in my prayers! I just recently learned about NF. My friend has twin nine year old boys who were diagnosed with the disease. It's something not many doctors even know much about! Thank you for sharing this story. We will pray, pray, pray for Sydney, her family & the doctors! We, as a family, have seen God heal things that man says are impossible (MS for one!). Nothing is too difficult for our ALmighty God. We will put a picture of Sydney on our family prayer board and pray daily for her complete healing. God is ALWAYS faithful! We pray peace for her family as well. Thank you for making us aware of this need. We consider it a privilege to pray for such a need! Thanks for posting about this precious child. My heart aches for Sydney and her family. Will definitely be sending up prayers on their behalf. God bless. We will defnately be praying for beautiful Sydney and her family. Sydney is absolutely precious! I will keep her in my prayers daily. That miracles will happen for this beautiful child and her family. Jesus says, “You do not have, because you do not ask”…so, Lord, we are asking for the supernatural healing of Sydney’s tumor. We pray that it’s growth and spread would be contained and even that it would shrink to nothing. We pray for a straightening of her spine, as well. Nothing is too hard for You, God. We recognize you as the ultimate, miracle-working healer. In Jesus’ name we pray…Amen. As someone who knows Sydney, let me again say….she is just precious! She is so sweet and loving…..just a doll baby! We will continue to pray for Miss Sydney! OH, what a beautiful girl…prayers sent up! Praying hard for this beautiful angel. My uncle had this disease and I really feel for Sydney and her family. My thoughts and prayers are with them. I will most certainly be praying….she’s just a beautiful little girl! My heart breaks for them all. what a story. I will keep her in my thoughts. This hurts my heart – I am heading over to add Sydney to my prayer list. Thanks so much for posting this. We will faithfully pray for this gorgeous little girl and her precious family. Our great big God has plans we could not even foresee, so I pray His healing hands wil guide this family and heal Sydney. We, too, have a Sydney. And we will pray for this Sweet Sydney too!